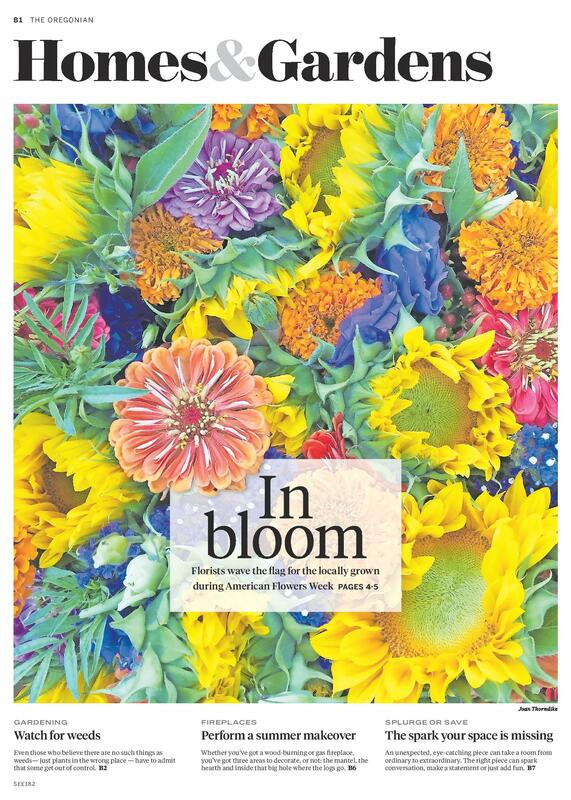 American Flowers Week’s botanical art by Ellen Hoverkamp. 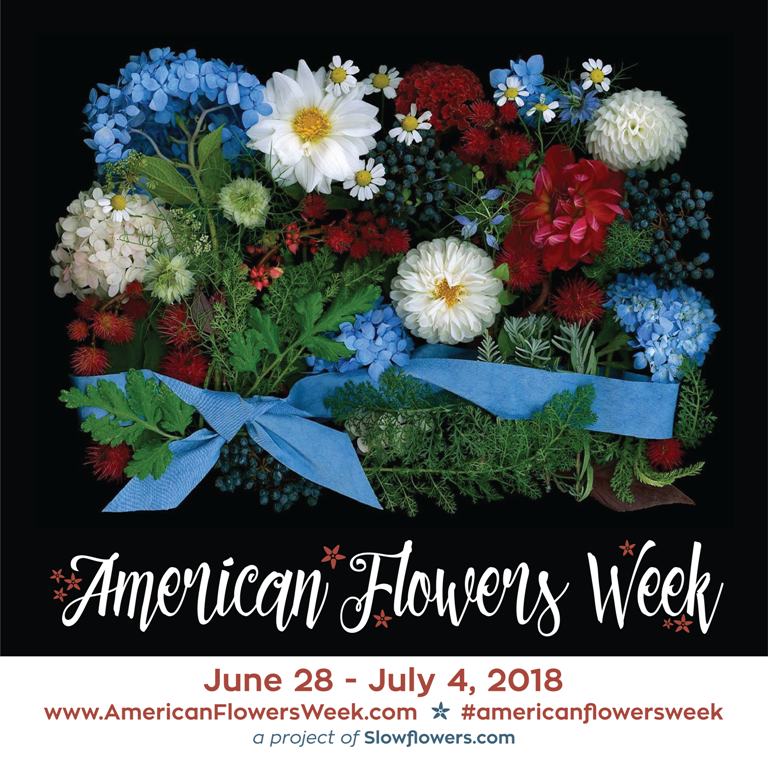 I created American Flowers Week in 2015 as a community-focused floral holiday that allows and encourages participation from everyone in the floral industry — from flower seed and bulb producers to growers; from designers to retailers; from cutting garden enthusiasts to artists. 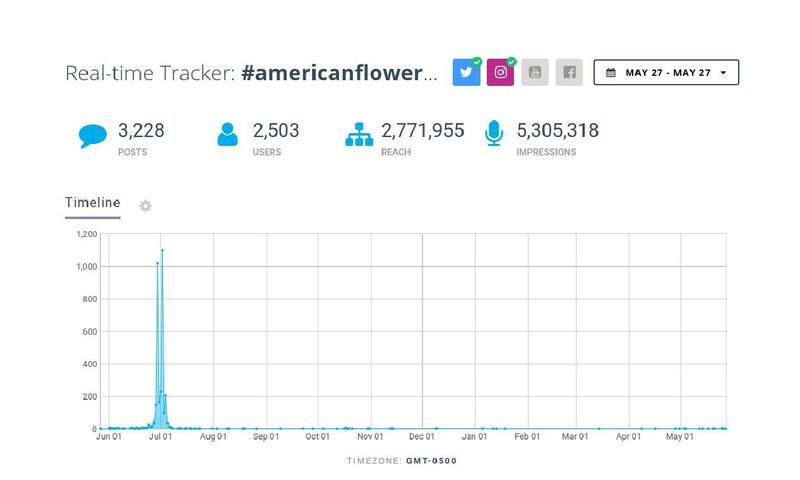 The hashtag: #americanflowersweek is trending with 5.3 million impressions in the past 365 days! Share your flowers — First and foremost, this is a grassroots, social-media focused campaign that relies on everyone’s voices joined as one to shout the benefits and values of domestic flowers. It’s simple, Take photos of your flowers — flowers and foliages that you grow, harvest or design. 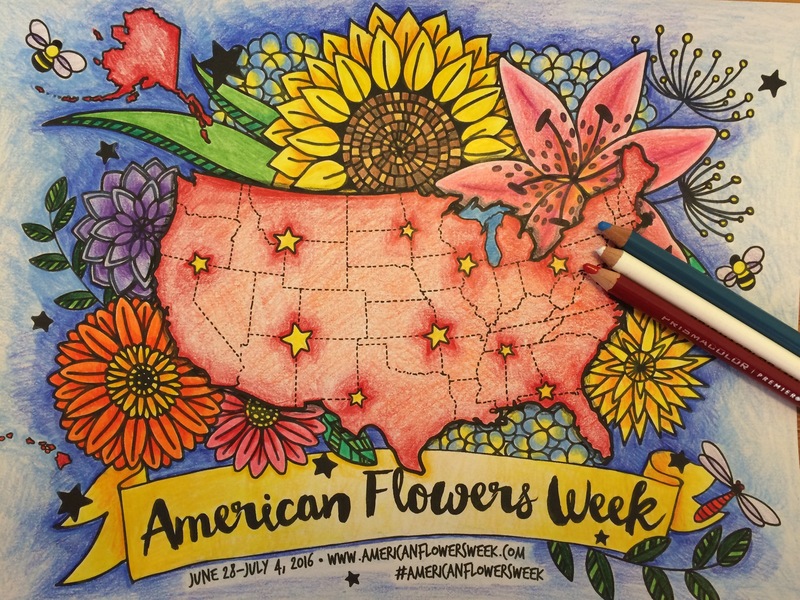 Post the images to social media outlets and use #americanflowersweek #slowflowers as your tags. 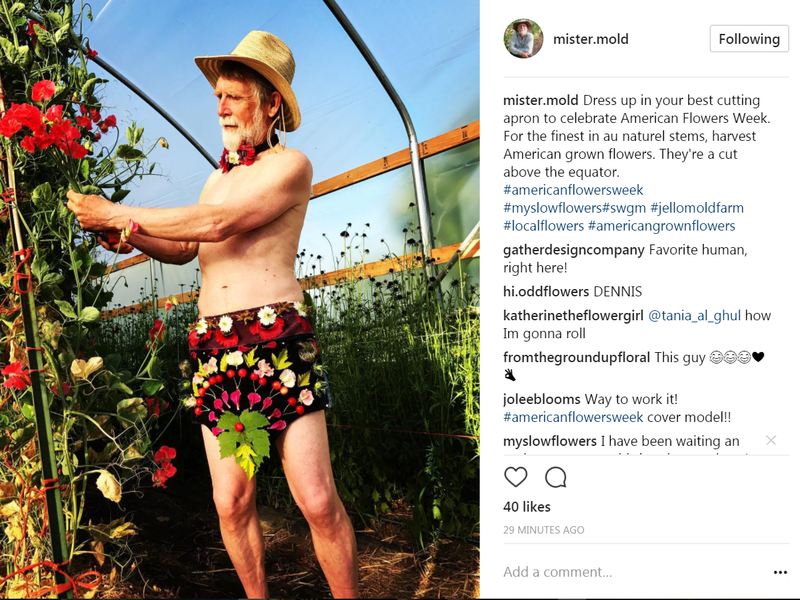 Tag @myslowflowers so we can see and document your posts, too. Social media posts are an easy and consistent way to broadcast your support for AFW! 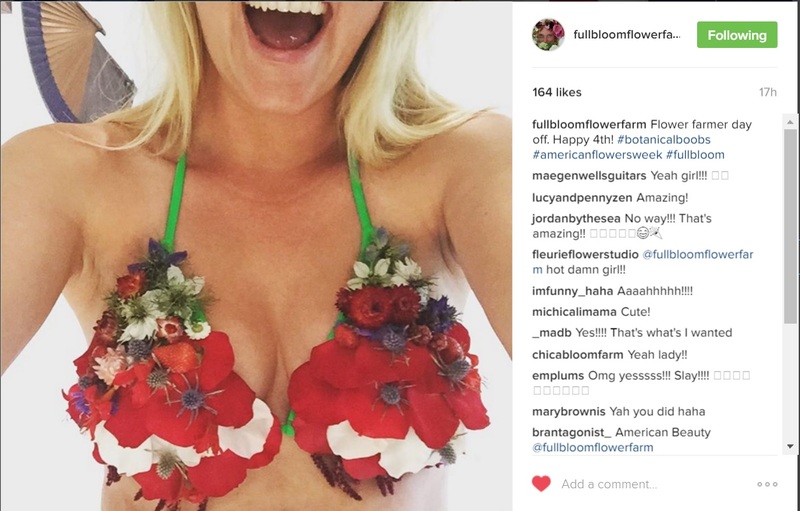 Slow Flowers member Hedda Brorstrom of Full Bloom Farm outside Sebastopol created the cutest American Flowers Week flower bra! 2. Create an installation — Floral installations and large-scale botanical displays are ambitious but also exciting ways to create interest and get the buzz going about you, your flowers and your commitment to American Flowers Week. 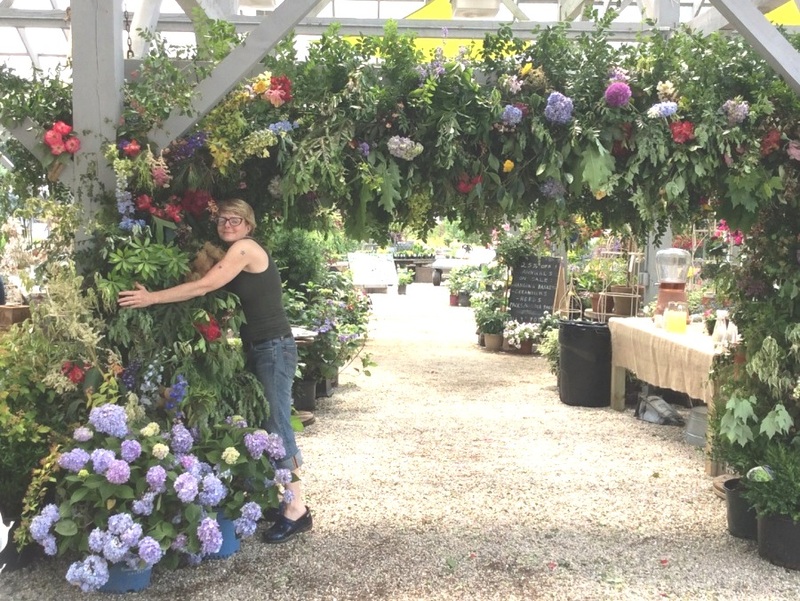 Last year, Rayne Grace Hoke of O’Donal’s in Maine turned her garden center’s greenhouse into a “live” floral experience during American Flowers Week. 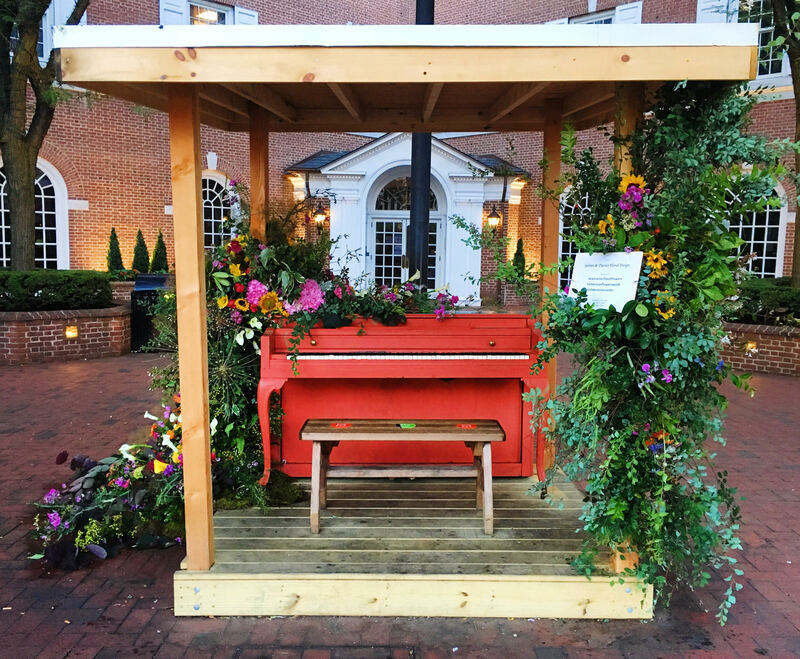 Tara Folker of Splints & Daisies in Lancaster, Pennsylvania, took over the public piano in her town square to celebrate American Flowers Week in beautiful & local blooms. 3. 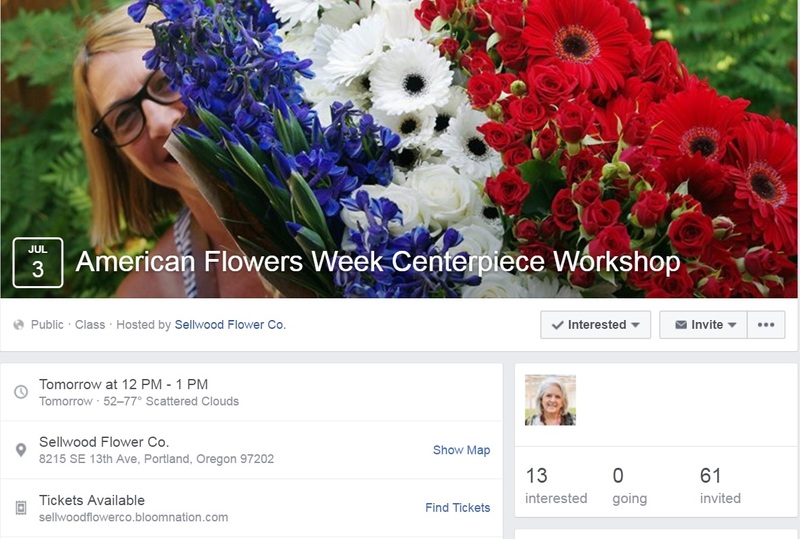 Host an event — Throw an American Flowers Week Party as a way to engage customers (professional florists and floral consumers alike) in the cause. It’s as simple as choosing a date and bringing flowers and people together. The location, the refreshments, the activities — all come together to focus the attention on Local and Seasonal Flowers! The Hudson Valley Flower Growers threw a fabulous party last year! 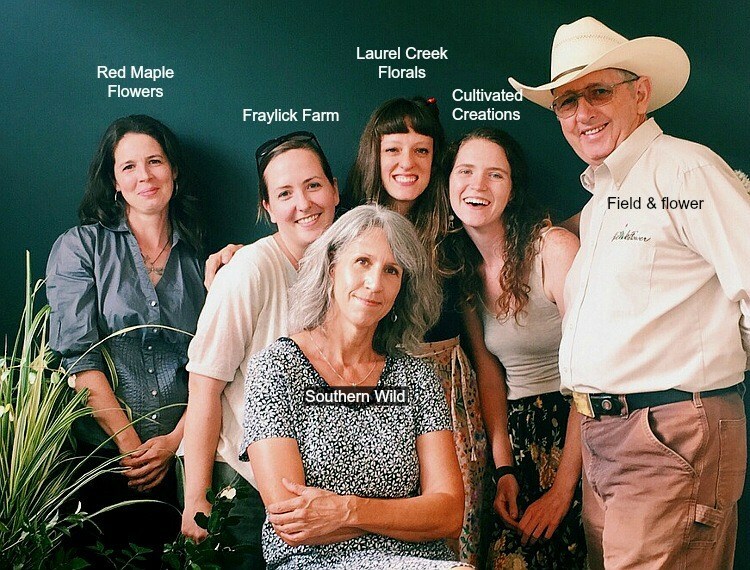 Read how the SC Upstate Flowers group threw a fabulous Farmer-Florist Party in their market. 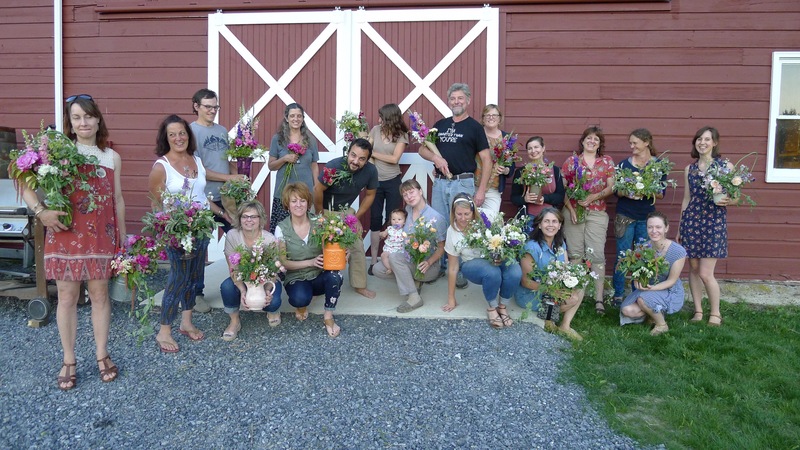 Kelly Shore of Petals by the Shore invited her customers and friends to a Flower Crown Workshop on a favorite flower farm. 4. 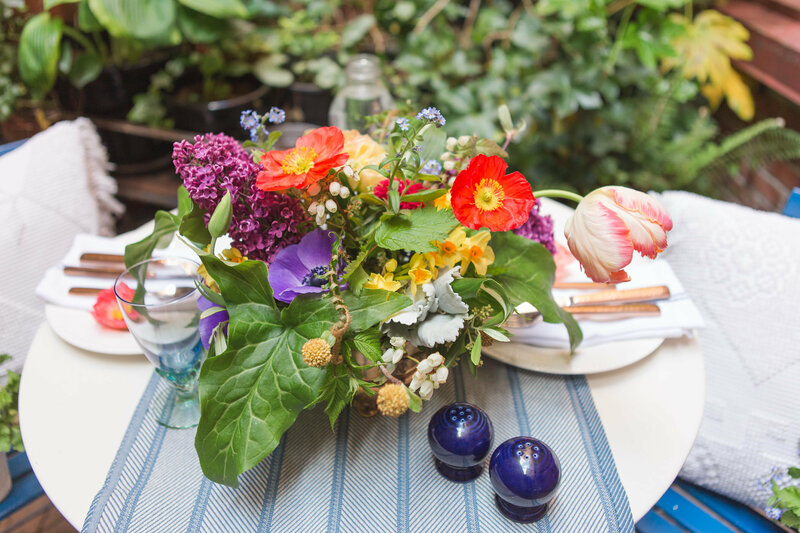 Teach a workshop — A hands-on floral workshop is a brilliant way to connect people with flowers. Past successes include workshops that invited students to “Design with Local Flowers,” “Make a Flower Crown” and more! Share your ideas with workshop participants hungry for information and inspiration. 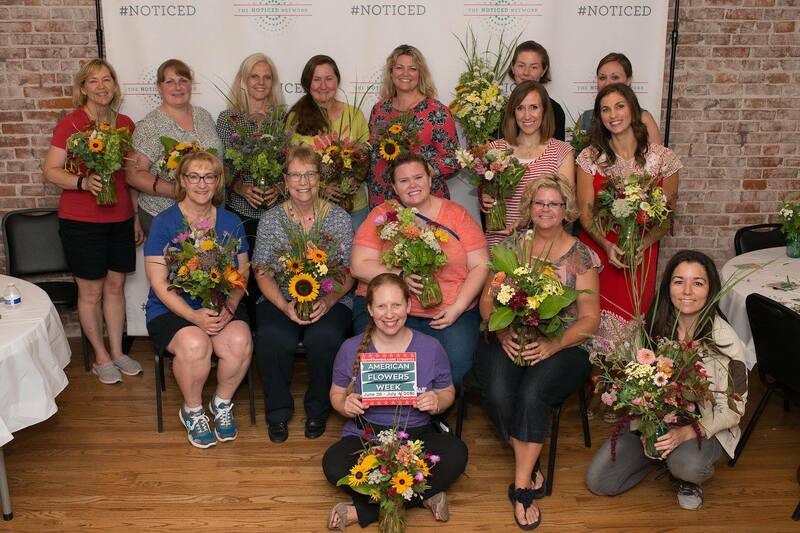 Andrea Grist partnered with local flower farmers to teach a design workshop in Kansas City. 5. Engage the public — Pop-up Events are exciting and inclusive because they make your flowers accessible to people in locations where they frequent, such as coffee shops, farmers’ markets and other retail settings. 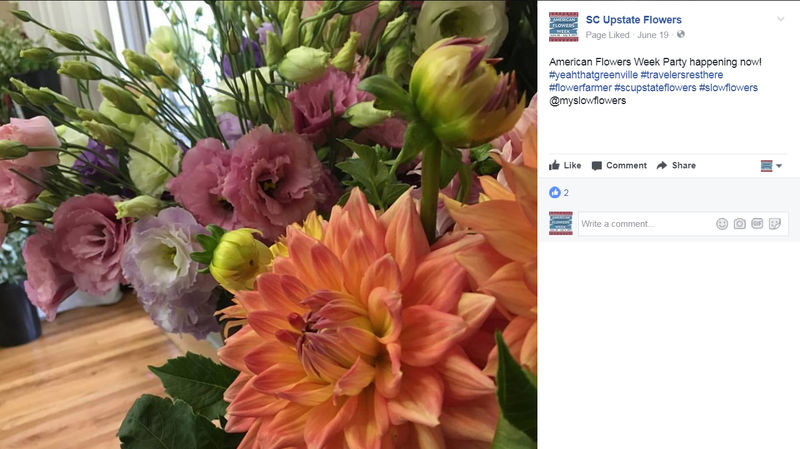 Sell, share and include local flowers in their lives! 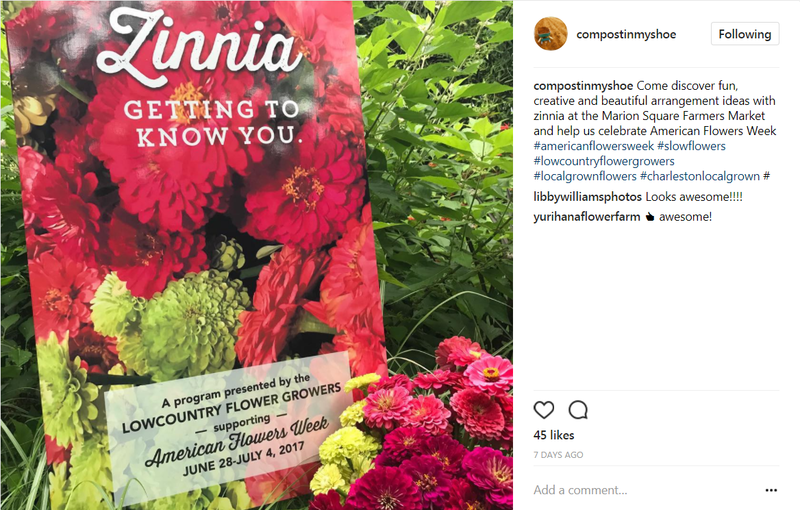 Low Country Flower Growers in the Charleston (SC) area hosted a pop-up Zinnia promotion at a local farmers’ market last year. 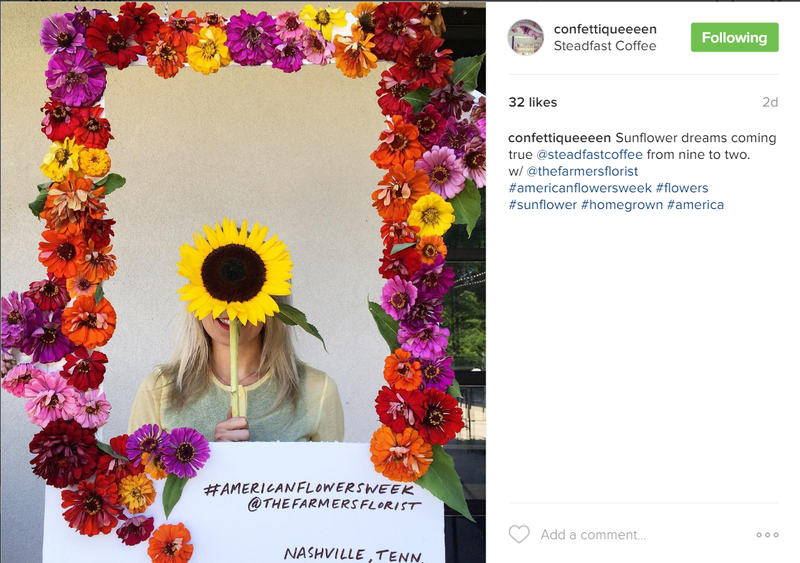 The Farmers Florist created a fun floral selfie frame for customers at a local coffee shop. 6. Use our graphics — Thanks to support from Slow Flowers members and sponsors, we’ve invested in fabulous graphics and free visual branding resources for you to down and incorporate into your American Flowers Week activities. Take advantage of this creative content and put your own spin on it! See the FREE DOWNLOAD button on the top of the home page. More resources here. 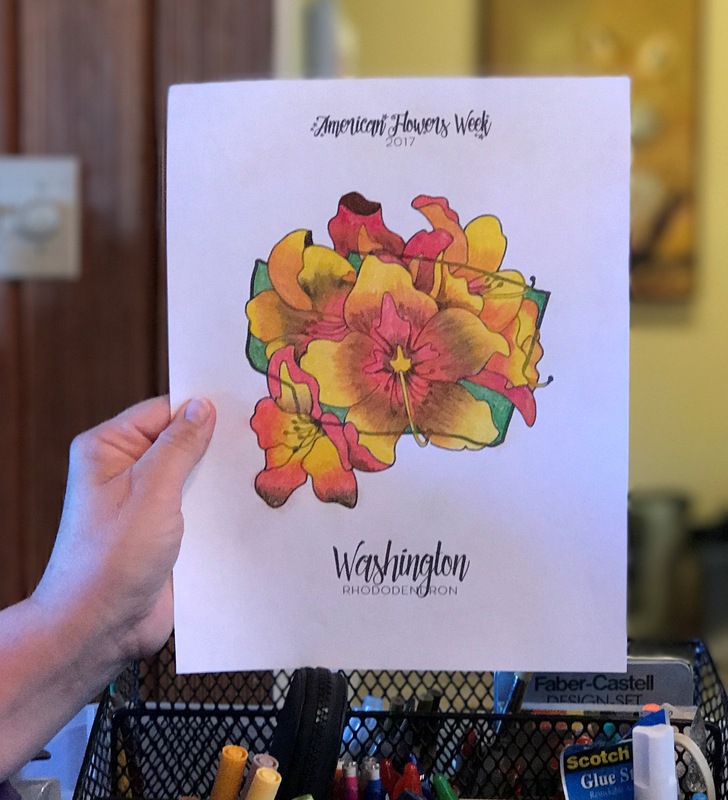 We now have coloring sheets for every state featuring the official state flower! 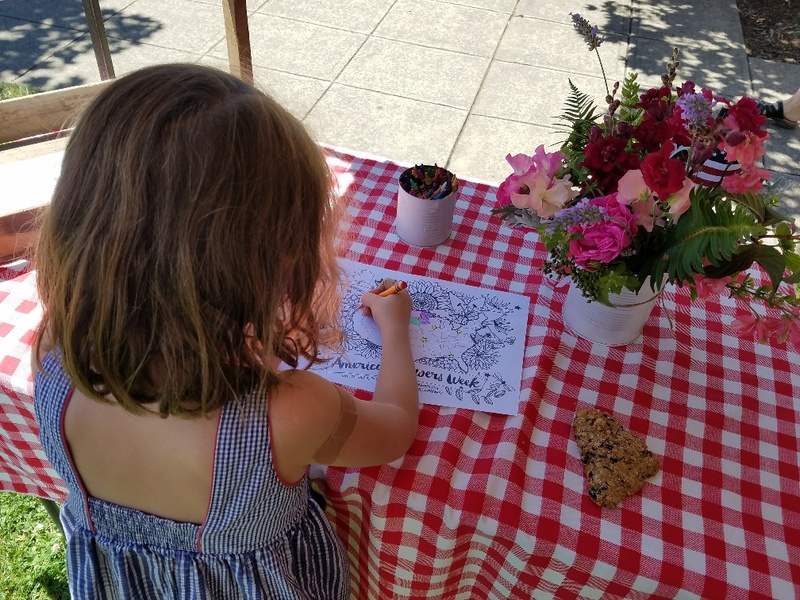 Crowley House Farm invited kids to color an American Flowers Week floral map at their Farmers’ Market stall. 7. Produce a styled shoot — We’re so impressed with the creativity and inventiveness of Slow Flowers members. 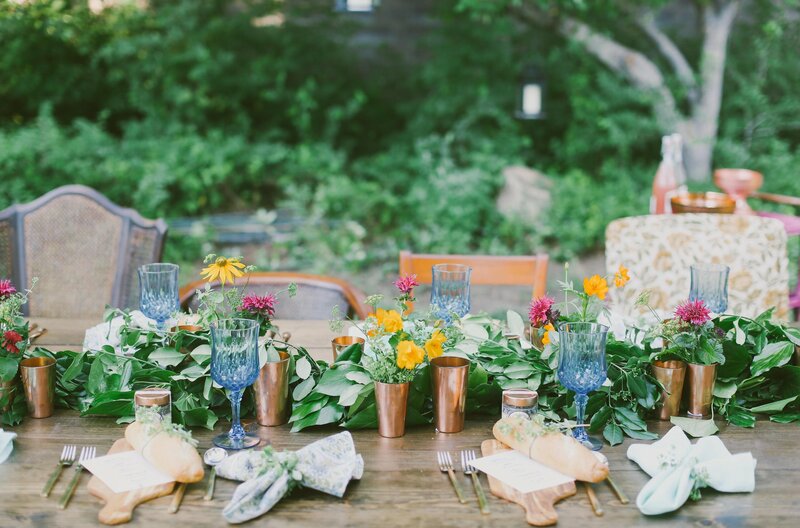 American Flowers Week offers a great platform to gather a creative team for a styled shoot. Pull your team together and see what you imagine and create — and share it with us! 8. Tell the media — When you create an event or beautiful visuals, it gives you an opportunity to reach out to local media and engage them (and their readers) with relevant and meaningful content. Use our sample press release and deliver it along with flowers to your local editor or news outlet. 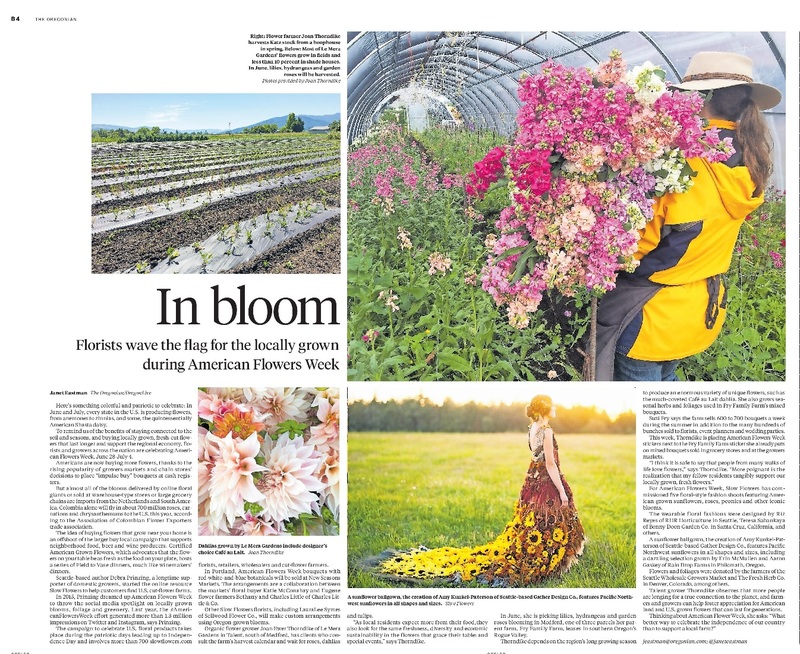 The Oregonian featured a fabulous spread about American Flowers Week in 2017, featuring local flower farmers and designers in the Pacific Northwest region. More images from the Oregonian’s 2017 story. 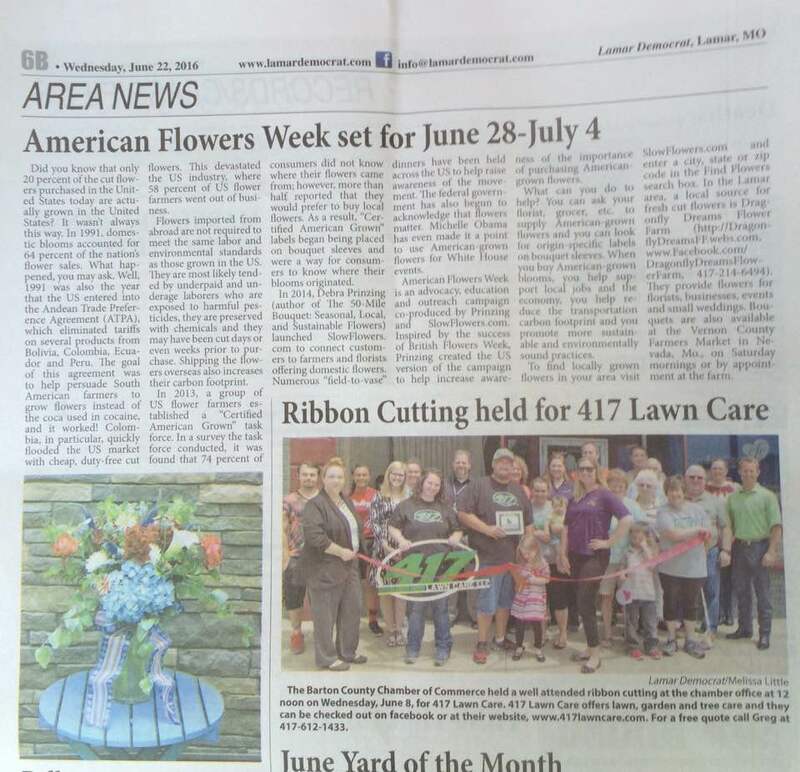 Localize the national story by putting you and your flowers into the news. 9. Be a brand ambassador — Share your ideas with others! Get in touch and we’re happy to send you extra resources for your projects. The best connections happen when you tell your story in an authentic and passionate way to people in your community. 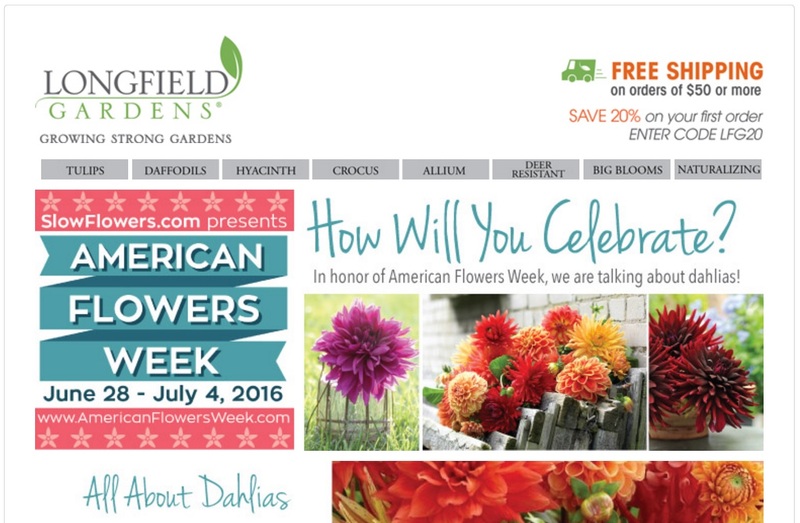 Tell your story in the context of American Flowers Week and let your audience know why it’s so important! We love it when our sponsors stimulate the conversation, too!